Writing a job description has always been a difficult task to do. Defining a specific job role for a particular organization is the primary challenge. The job of a business analyst is challenging too, and that incorporates a lot of things or responsibilities. The job description should list down all those things so that business can function in a proper way. To create Job Description Samples write-ups, using online samples is a good idea. You will get a hint for writing such documents neatly. 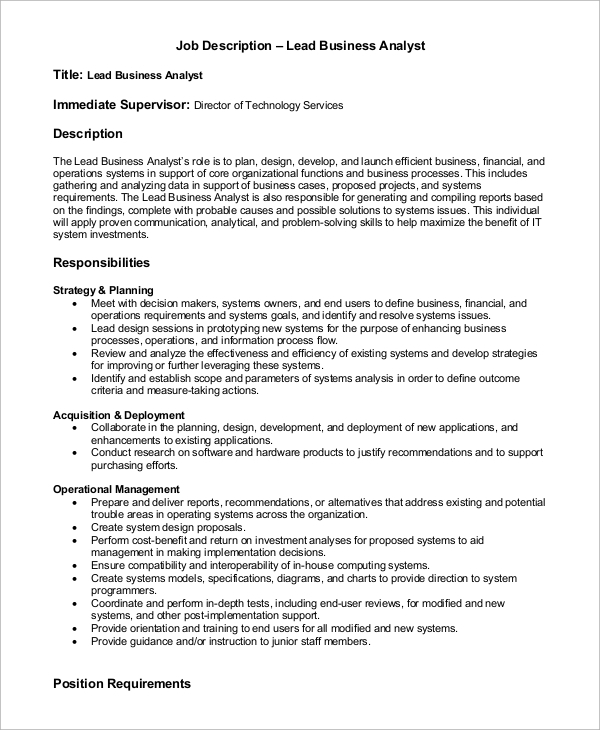 Job description for business technology analysts has to be written with care and precision. The HR managers can use this online sample to create such a job description with perfection. 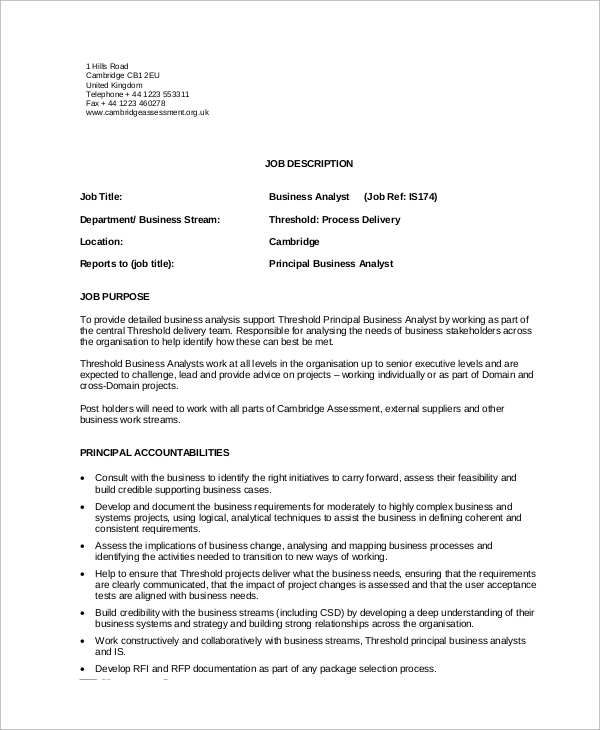 A senior business analyst has to perform a lot of tasks or jobs. For making his/her job well defined, the organization should have a proper job description. Here is a sample for that. The job of a business analyst intern should be well defined so that the person can function properly to meet the needs of the organization. Create a job description for such a person with this sample. 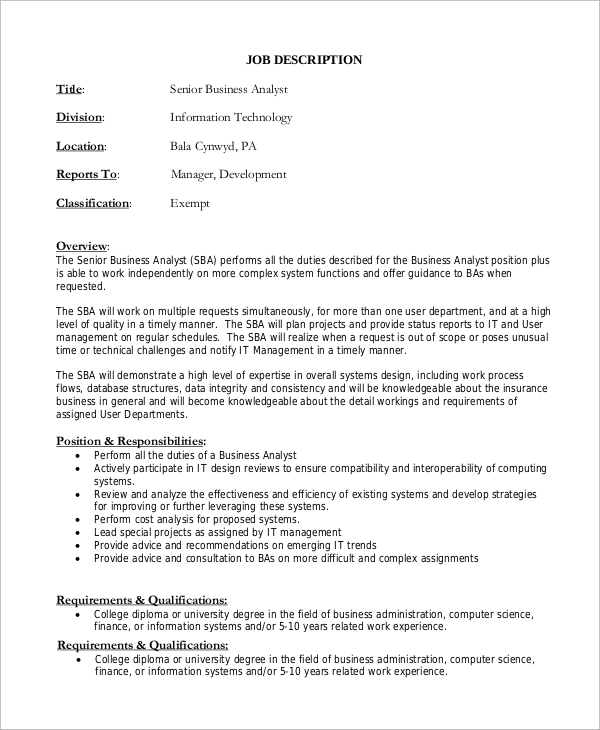 Business Analyst performs important jobs for an organization. This job post has been kept for a person who has extensive professional experience and knowledge. 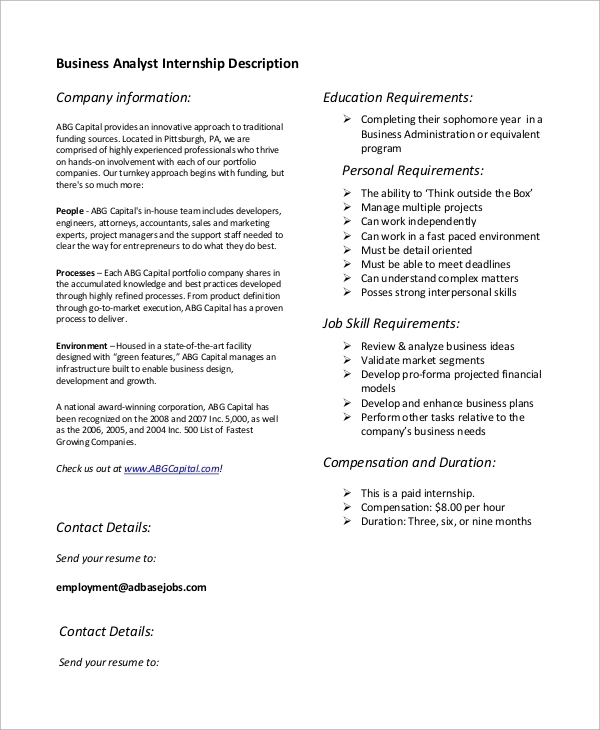 Create a job description for such a job post with this sample. The job description of a business analyst has to be well defined so that the company can be benefitted. This job description sample can be used for that reason. 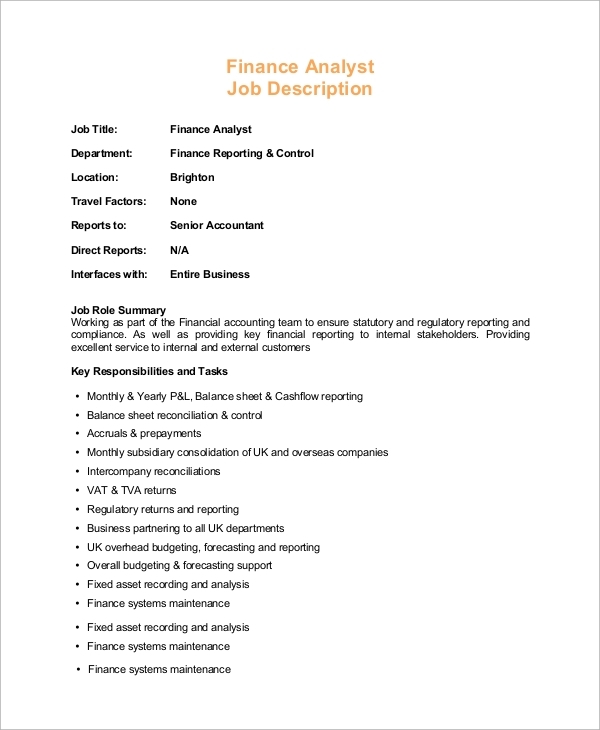 Create a seamless job description using this sample. A business or company or organization may have several departments, and for each department, there are several employees. For those specific tasks, specific employees are recruited. A software developer can not perform the job of an accountant. To keep the jobs for the employees well organized and properly defined, business managers or HR managers need to create a job description. Each job should come with its unique description so that it can be well defined. When the job is defined, employees understand their duties better. Overall, the organization performs strategically and correctly. For creating your job description, online samples should be used. 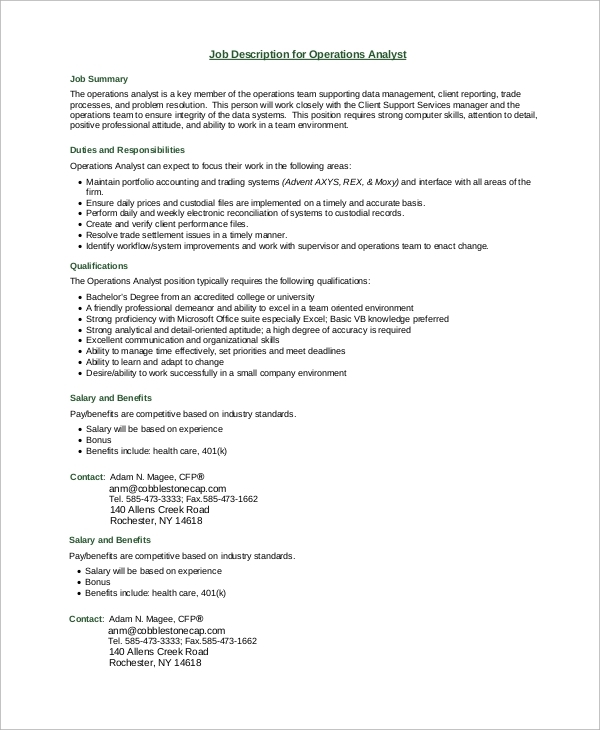 You can also see the Operations Manager Job Description. Who Should Use The Online Job Description Samples? The purpose of writing a job description is to define a job. Thus, a piece of write-up can be drafted by both the HR managers and the business owners. The job description should be well written and properly defined. If the write-up is confusing, it may cause various complications and confusions within an organization. One needs to ensure that job description should come with a proper format and professional tone of writing. The job of business analysts can vary from one organization to another. Though the basic job is the same, responsibilities can vary. This is why a company needs to create a Job Description Templates. This can also be used during the recruitment process. A job should be well defined, and when it comes to the job of a business analyst, the definition of the job should be precise for an organization. The role of the business analyst may vary, depending upon market conditions. This is why you need to opt for the job description write-ups.